INTERESTING EYE NEWS & CLINICAL PEARLS: DOT HEMORRHAGE NEAR FOVEA. TREAT? 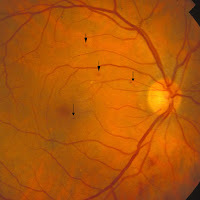 DOT HEMORRHAGE NEAR FOVEA. TREAT? "No patients with a single blot haemorrhage within one disc diameter of the fovea on digital retinal screening required laser treatment."